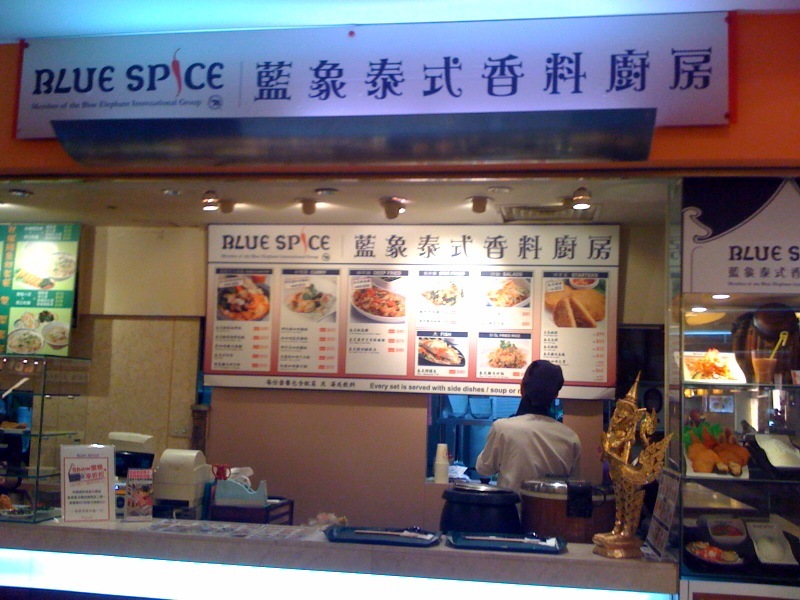 I'm always a little bit wary of restaurants once we wander too far out of Taipei. For some, it's an adventure to discover local tastes and dishes, but for me, I usually think of menus only in Chinese, winding roads of unfamiliar restaurants and squat toilets. I don't like squat toilets. But at least I'm with relatives who also love food and have picked some good places in the past. 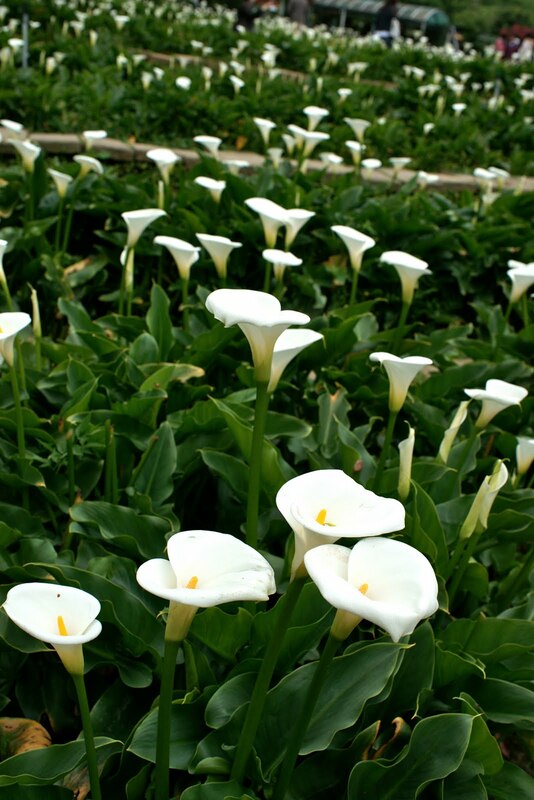 On this occasion, they want to take me to Yangmingshan where you can walk the field of cally lilies next to the restaurant, take photos and even pick some to take home. It's kind of a nice retreat from the city and not as far as some of the other places we've gone, like the sheep farm or aboriginal village. The relatives order a dizzying array of food and before we know it, the red plastic covered table is covered with dishes. While we wait, there is a sweet potato soup (NT$30/bowl) that comes first with huge chunks of sweet potato infused with a sweet ginger flavor from the soup it was boiled in. and the heaping plate of mian xian which are thin, wheat flour noodles that are surprisingly addicting, slippery with the rich sesame oil flavor and boiled to a soft, but not mushy bite. So if you're looking for something different, you can find your way to Yang Ming Shan, enjoy the views and fresh air, and order away at this restaurant tucked in the mountainside. One of the things I miss in Taipei is Thai food delivery. In LA, if I feel like some pad thai, tom kha gai soup or green curry, I just make a quick phone call and half an hour later, I'm eating my steaming hot food and I didn't have to fight traffic, find parking, or find other people to eat with. In Taipei, if I want Thai food, I usually end up at Thai Town or Mei Kung, both great, but more sit down and suitable for a meal for a larger group so you could have more variety. In Taipei, I have yet to find a Thai restaurant that delivers, or maybe I'm just missing some special code or place that you guys need to clue me into. So the next best thing to delivery is to-go. So I decided on pad thai(NT$150) to-go after musing over Blue Spice's English and Chinese menu of curries, noodles, fried chicken and appetizers after catching a movie at Breeze. The prices range from NT$55-$180 and I was pleasantly surprised to find out that with my to-go order I could choose either soup or thai ice tea. I chose thai ice tea and it was sweet and not watered down. Another thing that surprised me was the complimentary mini appetizers on the side that were included- glass noodle salad, pork and egg which had strong sour and spicy flavors that complimented the pad thai. The portion was filling, but not quite enough to share. I look forward to going back and trying some of the other things on their menu- the green or red curry with chicken or the fried chicken with chili sauce, which the friendly cashier said was a best seller. I've had some pretty bad experiences with Southeast Asian food in Taipei food courts for some reason- the Singaporean/Malay stall near Jasons in 101 or Pho in Eslite and Breeze Main Station- but Blue Spice is definitely worth a try for Thai food lovers. Steak lovers will enjoy tender, medium rare steak in a beautifully designed, open kitchen, upscale casual space in the Grand Victoria Hotel. Opened early this year, No. 168 Prime Steakhouse brings the expertise of A-Cut chef Danny Teng to bring the steakhouse experience in Taipei to another level. I never made it to A-Cut despite hearing about how it was "the best steak in Taipei", but after trying eating at a restaurant run by the former A-Cut's founder, I can see how he has a magic touch for steak. The first thing I noticed when I entered into No. 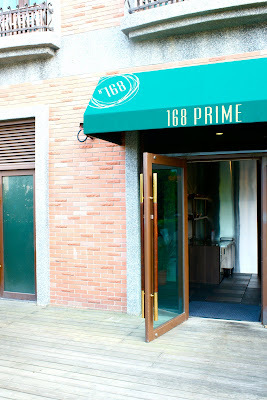 168 Prime Steakhouse was the unique details of the entrance and dining room. 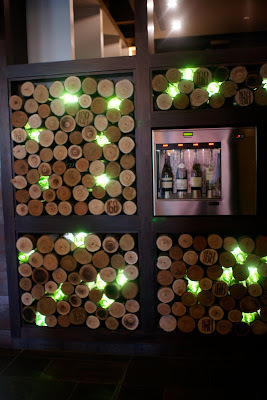 Wood echoes prominently as a theme in the design, but in a modern, artful way. The second thing was the large open kitchens and the chefs busy at work, making pizzas and preparing dishes. While they have six private rooms (the largest can seat up to a party of 50), it's a pleasure to sit in the main room. The third and maybe the most subliminal thing was the open airy space and light from all the windows in the main room. Many of the other steakhouses I've been to are dark and enclosed- Ruth Chris, Robin's Grill, Lawry's- which give it a old fashioned feeling somehow; and No. 168 Prime Steakhouse is the opposite. 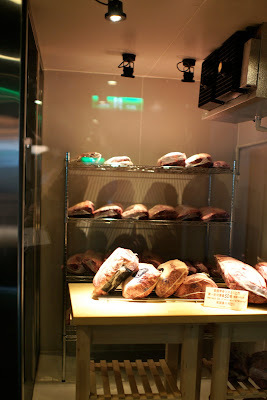 If you wander around, you'll see the dry aging room around the corner from the kitchen. 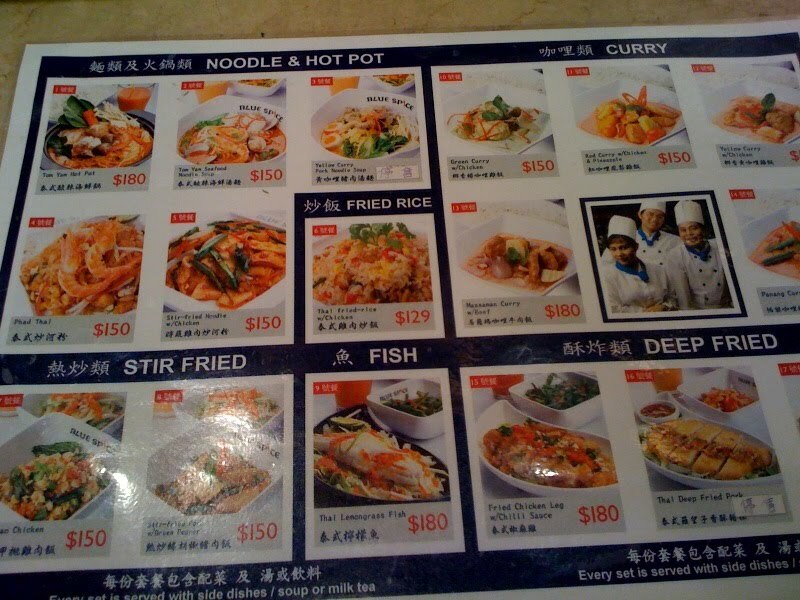 The first time I went was for a party, and there was a set lunch menu that the host selected. The lunch and dinner sets are the best deals, as they include a starter, salad, soup, main dish and dessert. I've heard that the sets are not as expensive as A-Cut's were, and are affordable at around NT$800-$1500 for lunch and NT$1600-$2000 for dinner sets. We all found it really hard not to resist the complimentary bread- it's spongy and pliable, and tastes freshly baked. 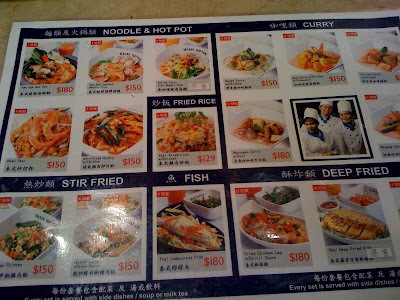 The two starters we had to choose from were the sizzling hokkaido scallop or taraba crabcake. I chose the scallop, which was wonderfully sweet from the right amount of searing, carmelization and flavor from the parsley puree and beurre blanc sauces. Though Mushroom Cappuccino soups seem to be popping up everywhere in Taipei restaurants, this has to be one of my favorite executions, with a sweetness and smokiness to the soup and airiness from the froth. If I didn't misunderstand the waiter, I think he said there was actually a touch of coffee beans in the soup. Along with main dishes comes an elaborate set of salts, mustards and sauces to choose- from Himalayan Rose, Hawaiian or French sea salts; dijon mustard, grain and English mustard; to red wine, horseradish or Bearnaise sauces- it feels like the chef has traveled the world to bring you the best accompaniments for your steak. On my second visit, I copy my friend, who smartly creates his own palette of sauces in a clockwise fashion. That's an engineering major's mind at work for you. I am not sure I could have ever came up with that on my own- and thus I could have never majored in engineering! The USDA Prime Filet comes in a iron cast skillet with a roasted whole garlic and tomato. The garlic butter had melted already since the servers were running around serving everyone, but the steak is still amazing. It was also probably the first time I noticed a steak knife like this, it sliced through the meat like butter. I've never been that crazy about eating garlic (some of my friends in LA adore the Stinking Rose), but I try the roasted garlic clove and its practically melts in my mouth with a sweet creamy texture. Weird! I like garlic! For those that aren't red meat lovers, there's roasted chicken, quail, king salmon and pork chop and lamb options. Here was a huge roasted chicken my friend couldn't finish. Out of the three desserts I sampled, my favorite was the warm chocolate cake and after I research for this post, I understand why. Danny Teng was also the founder of Ben Teppanyaki which also had a memorable warm chocolate cake (not to mention the biggest piece of foie gras I'd probably ever had). The Caramel Affogato looks and sounds good with brownies cubes and carmelized bananas, but the brownies are much drier and harder in comparison to the chocolate cake. For lighter fare, there's the seasonal fruit tart. On my second visit, I got a lot of the same- the scallop, the mushroom cappucino, the warm chocolate cake, but this time, I had the Black Angus Top Cap steak and I liked it even more than the filet. It was more tender and juicy and I savored every bite. There's also pastas and pizzas, which are great to share or for kids. The Porcini mushroom pizza is as addictive as the bread, with its doughy crust. From the presentation to the ambiance to the food, I can't remember another place where I've had as good steak. No. 168 Prime Steakhouse could be in Beverly Hills or Las Vegas, and it could compete with the best of them.